Anyone who’s ever been to a birthday party with a bunch of feisty toddlers knows that it can feel a little like you’re at the zoo. 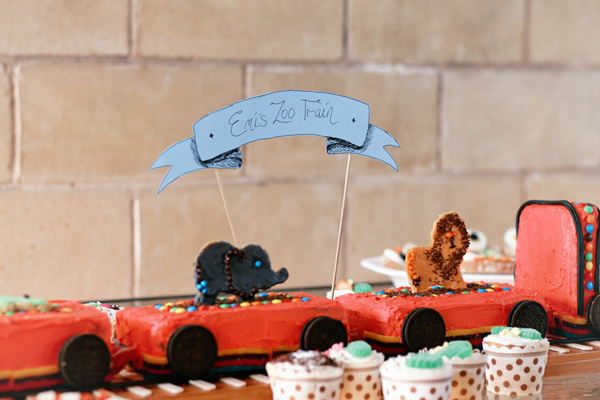 We say go with it and make the party a zoo themed affair. 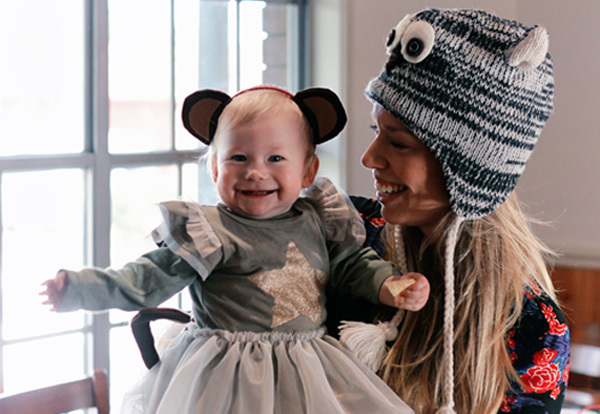 That’s just what Heidi did when her beloved daughter Emi turned one recently. So many cute, easy ideas, we’re sure that this is one party that will have you all pinning like crazy! Let’s start with the food. I’m sure you won’t be surprised to know that the tiny crowd at this party were left wide-eyed when they surveyed the refreshments that Heidi served up. Well, we’re both wide-eyed and slack-jawed. Come, take a look for yourself. Healthy party food has never been this much fun. Have you ever seen such a mouth-watering little piggy? 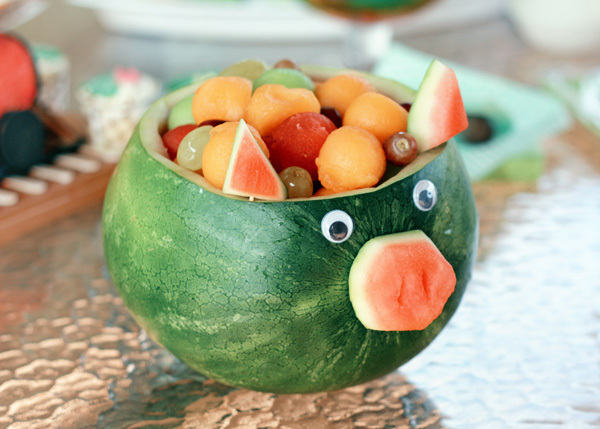 What a delightful and different way to serve fruit, all dished up in toddler-friendly chunks. 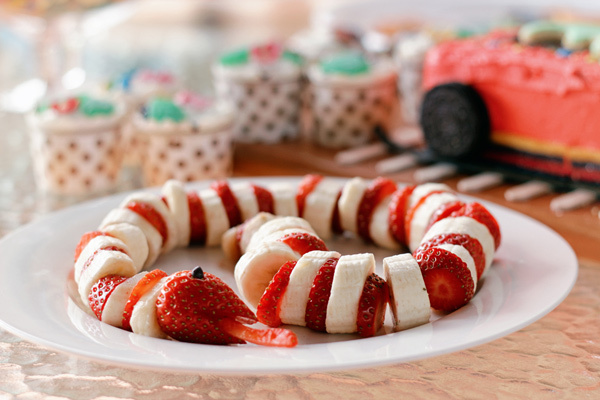 Next came finger-sized chunks of strawberry and banana disguised as a not-so-scary snake. 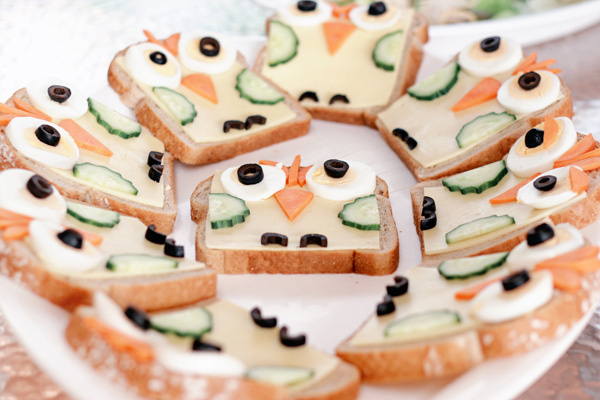 And oh, how much do you love these owl sandwiches? I bet it’s not as much as we love them. Cheese, carrot, cucumber, egg and olive on rye. Impressive and simple at the same time. Now, if you thought those were high on the cuteness quotient, take a look at these. Snail sandwiches. But not in a gross-I’m-not-gonna-eat-that kind of way. 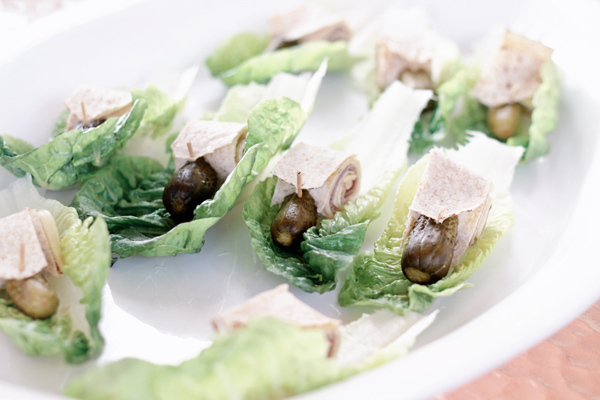 These molluscs are made with a gherkin body and a little lavash wrap-bread shell, all sitting pretty on a leaf of baby cos lettuce. Incredibly creative. Of course, a party isn’t a party if the kids don’t get to indulge in something sweet. 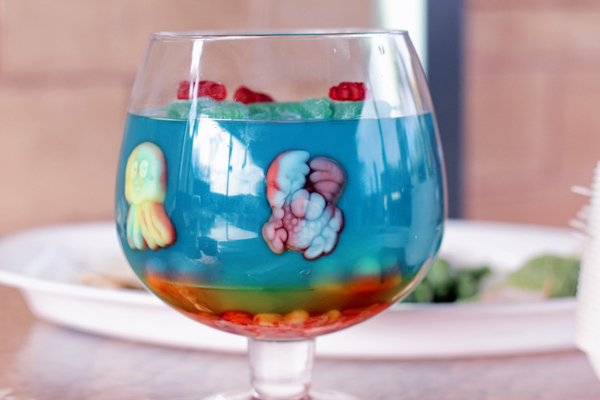 Heidi made marine jelly using gummy sea critter lollies found at Penrith candy store My Sweeties. They also got to tuck into a buttercream birthday train cake, adapted from everyone’s favourite vintage birthday cake bible, The Australian Women’s Weekly Children’s Birthday Cake Book. 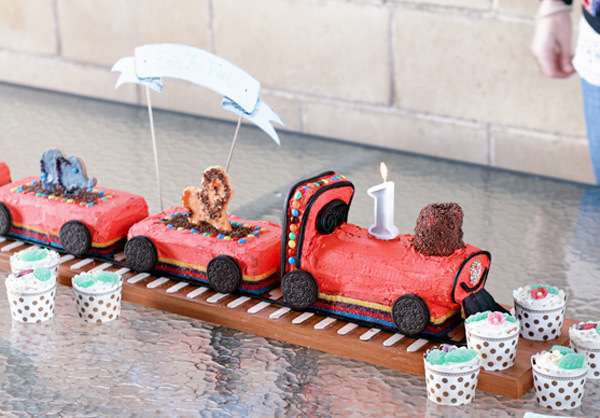 I’m sure many of you had your own birthday fantasies of that train cake as kids! Want more adorableness? Heidi has it covered. Check the squee-worthy monkey ears and tail she made as a birthday costume for Emi, using a plastic headland, some pipe cleaner and a piece or two of felt. Definitely one creative mummy. I also love how adult guests got into the party spirit by donning animal hats found at local dollar stores.